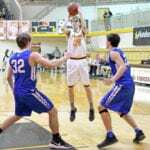 Crockett’s Mchale Bright jumps to put some points on the board for the Pioneers against Unicoi’s Troy Podvin (32) and Trevor Hensley. Crockett's John Kollie goes up for the grab. Bryan Rodriguez is on defense. Camara Bradley makes a run down the court against Unicoi.